The importance of ovarian preservation in patients with infertility related endometriosis has long been debated (1). Endometriomas do impair fertility and studies have demonstrated improved IVF outcomes after ovarian cystectomy and treatment of endometriosis in matched controlled studies (2). The article by Tsolakidis et al. (1) deserves praise for several points and also raises some concern, as others may use this information as a guide in the treatment of their patients with endometriomas. With the techniques described including method of removal, use of different energy sources, etc, it is not surprising that AMH levels in the second group of their patients are higher than those having complete resection of the cyst (1). It has been our experience that the techniques we have described before causes minimal destruction of the healthy ovarian tissue (3, 4, 6, 7). We use diluted vasopressin (20 units in 200 cc of normal saline) to dissect the cyst wall off the ovarian stroma. We use three graspers with teeth. Two of the graspers are used to stabilize the ovary while the third is used to remove the capsule (Figures 1, 2). With this technique, one is able to remove the ovarian cyst with minimal to no bleeding. The final result is complete resection with minimal damage to the ovary and no unnecessary use of cautery if the surgeon is in the right plane. More figures available upon request. Figure1. Three grasping forceps are used. No bleeding observed. Figure2. Two grasping forceps with teeth stabilize the ovary while the third dissects the cyst capsule from the ovarian stroma. In 1992, Nezhat et al. described a new classification of endometriomas (4), seven decades after Sampson’s original model (5). In this theory, confirmed by pathology, endometriomas were divided into two groups. Type I or primary endometriomas, originate from invagination of endometrial glands and stroma into the cortex. These are true endometriomas usually between three to five centimeters or smaller. Type II or secondary endometriomas are functional cysts that have been invaded by endometrial glands and stroma (6). We do not vaporize or coagulate endometriomas because the cyst wall can be as much as 5 mm thick (3). This leads to inadequate treatment and destruction of the ovarian stroma. The result is increased risk of recurrence and further unnecessary surgery. Currently, many of our referrals have a history of multiple failed IVF cycles and/or recurrence of their endometriomas previously aspirated by ultrasound. During surgery on these patients, we have observed a severe inflammatory process if we operate on them without preoperative suppressive therapy. We presume this to be from leakage of “chocolate material” and blood from a previous aspiration. Presently, we start these patients on GnRH suppressive therapy for 2-3 months and then proceed treatment of endometriosis and removal of the ovarian endometrioma(s). Thus, we convert at least two, sometimes three surgeries, into one and have noted rare recurrence of endometriomas. Also, by not using laser, electrocautery and not avulsing healthy ovarian tissue, we preserve ovarian function. We continue to have good results (2, 3). We plan to begin assessing serial AMH levels in our patients prior to and after surgery. As in the above mentioned article, we anticipate our technique to show increased postoperative levels. 1. Tsolakidis D, Pados G, Vavilis D, Athanatos D, Tslikis T, Giannakou A, Tarlatzis BC. The impact on ovarian reserve after laparoscopic ovarian cystectomy versus three-stage management in patients with endometriomas: a prospective randomized study. Fertil Steril 2010 Jun; 94(1): 71-7. 2. Littman E, Giudice L, Lathi R, Berker B, Milki A, Nezhat C. Role of laparoscopic treatment of endometriosis in patients with failed in vitro fertilization cycles. Fertil Steril 2005; 84(6):1574-8. 3. Nezhat, C., Crowgey, S. R. & Garrison, C. P. Surgical treatment of endometriosis via laser laparoscopy. Fertility and sterility 45, 778-783 (1986). 4. Nezhat C, Nezhat F, Nezhat C, Seidman DS. Classification of endometriosis: improving the classification of endometriotic ovarian cysts. Hum Reprod. 1994 Dec; 9(12):2212-3. 5. Sampson JA. Perforating hemorrhagic (chocolate) cysts of the ovary. Arch Surg 1921; 3: 245-323. 6. Nezhat F, Nezhat C, Allan CJ, Metzger DA, Sears DL. Clinical and histologic classification of endometriosis: implications for a mechanism of pathogenesis. J Reprod Med 1992; 37: 771-776. 7. Bulent Berker et al. Laparoscopic treatment of endometriosis. Chapter 10.3. Pages 263-303. Nezhat’s Operative Gynecologic Laparoscopy and Hysteroscopy. Cambridge University Press, 3rd Edition. July 7, 2008. Despite the ongoing debate regarding optimal laparoscopic treatment for ovarian endometriomas, cystectomy remains the gold standard of their treatment for minimizing the risk of recurrence (1) and this is in accordance to the results of our prospective, randomized study (2). However, cystectomy is associated with ovarian reserve damage according to our results, as AMH levels were significantly decreased in this group (2). This detrimental effect has been attributed to either inadvertent removal of the adherent healthy ovarian tissue or to the use of bipolar diathermy for hemostasis. However, there are conflicting results addressing this issue (3-6). The adoption of one method over the other may be based on different criteria including recurrence rates, relief of symptoms, pregnancy rates, number of interventions and financial impact for both the patient and the health system, surgical prerequisites, but the bottom line should be the impact on the ovarian reserve. This issue is even more crucial in patients who have undergone repeated surgery for endometriotic cysts, for those with very big endometriomas and of advanced reproductive age (7). Therefore, we totally disagree with your raised concern and the information based on the results of our study should be used as a guide for the selection of the optimal surgical approach only if the issue of “ovarian reserve” is concerned. The proposed by Lewis et al laparoscopic cystectomy with the use of diluted vasopressin seems an alternative bloodless technique minimizing the destructive effects of electro-coagulation. Of course, it should not be ignored that vasopressin is a rare but potential life-threatening drug, as you have clearly demonstrated (8), and its use needs caution by the surgeon. The problem of healthy ovarian tissue removal needs further evaluation in order to characterize the proposed technique as an ovarian tissue sparing procedure because cleavage plane is usually absent or difficult to be identified due to the intrinsic endometriosis-induced fibrosis. Also, the preoperative administration of GnRH-a adopted by your group is considered questionable and no such recommendations can be made based on the results of the recent literature. Furthermore, delaying surgery under medical suppression may be inopportune when the nature of the cyst has not been fully defined, while small endometriotic cysts may escape laparoscopic recognition and therefore appropriate treatment. Also, fibrosis induced by GnRH-a further may enhance the difficulty in finding the cleavage plane, thus resulting in removal of healthy ovarian tissue or incomplete treatment. Although the thickness of entire fibrotic capsule surrounding the endometrioma may be up to 5mm, it is necessary to vaporize only the filmy superficial internal lining with CO2 laser up to 1.0-1.5mm (9-10) and this is the concept of administration of GnRH-a in the “three stage technique.” However, precise recognition of depth destruction and complete vaporization of all internal lining and especially close to the ovarian hilus with the use of laser without leaving intact any viable endometriotic tissue is difficult and depends on the surgeon’s skills and experience (11) . 1. Hart RJ, Hickey M, Maouris P, Buckett W. Excisional surgery versus ablative surgery for ovarian endometriomata. Cochrane Database Syst Rev. 2008 Apr 16;(2):CD004992. 2. Tsolakidis D, Pados G, Vavilis D, Athanatos D, Tsalikis T, Giannakou A, Tarlatzis BC.The impact on ovarian reserve after laparoscopic ovarian cystectomy versus three stage management in patients with endometriomas: a prospective randomized study. Fertil Steril 2010 Jun; 94(1): 71-7. 3. Ho HY, Lee RK, Hwu YM, Lin MH, Su JT, Tsai YC. 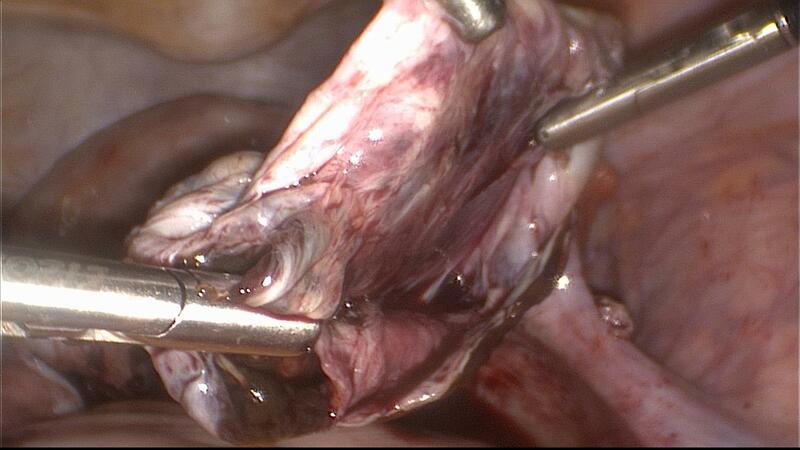 Poor response of ovaries with endometrioma previously treated with cystectomy to controlled ovarian hyperstimulation. J Assist Reprod Genet.2002;19:507-511. 5. Canis M, Pouly L, Tamburro S, Mage G, Wattiez A, Bruhat M. Ovarian response during IVF-embryo transfer cycles after laparoscopic ovarian cystectomy for endometriotic cysts of >3cm in diameter. Hum Reprod.2001;16:2583-2586. 6. Alborzi S, Ravanbakhsh R, Parsanezhad ME, Alborzi M, Alborzi S, Dehbashi S. A comparison of follicular response of ovaries to ovulation induction after laparoscopic ovarian cystectomy or fenestration and coagulation versus normal ovaries in patients with endometrioma. Fertil Steril. 2007;88:507-509. 7. Pados G, Tsolakidis D, Bontis J. Laparoscopic management of adnexal mass. Ann NY Acad Sci. 2006; 1092: 211-228. 8. Nezhat F, Admon D, Nezhat CH, Dicorpo JE, Nezhat C.Life-threatening hypotension after vasopressin injection during operative laparoscopy, followed by uneventful repeat laparoscopy.J Am Assoc Gynecol Laparosc. 1994;2:83-6. 10. Donnez J, Wyns C, Nissole M. Does ovarian surgery for endometriomas impair the ovarian response to gonadotropin? Fertil Steril.2001;76:662-665. 11. Donnez J, Nisolle M, Gillet N, Smets M, Bassil S, Casanas-Roux F. Large ovarian endometriomas. Hum Reprod.1996;11(3):641-646. 12. Canis M, Mage G, Wattiez A, Pouly JL, Bruhat MA. The ovarian endometrioma : why is it so poorly managed ? 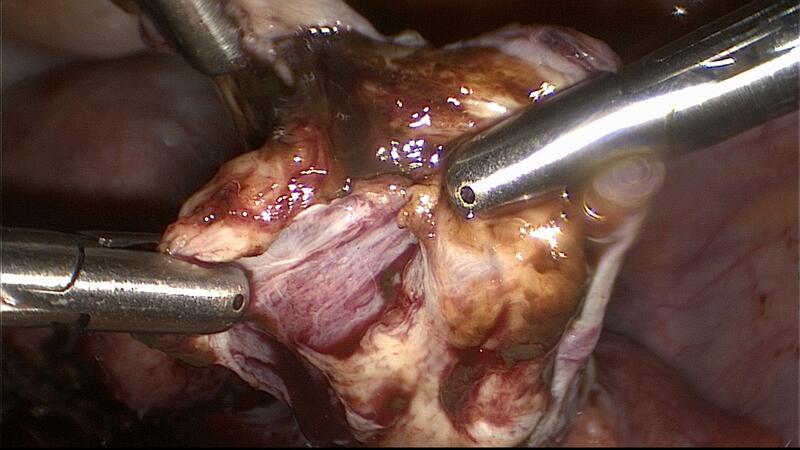 Laparoscopic treatment of large ovarian endometrioma: why such a long learning curve? Hum Reprod. 2003;18(1):5-9.